Just sayin’ – miscellaneous thoughts. I’ve posted a favorite quick cool weather soup before… cannellini beans, Italian sausage, a little minced garlic and greens in a chicken broth. Very satisfying and very tasty. After a couple of days in the 90’s, a late spring cold front came through with winds, scattered showers, hail in some areas and temps in the 60’s with a seriously uncomfortable chill factor. I thought about the beans and greens soup, but a winter soup in May didn’t sound quite right. I decided to turn the soup into a pasta sauce instead. Bucatini, beany,greeny sausage supper. Sorry, some of the time I can’t resist a rhyme. 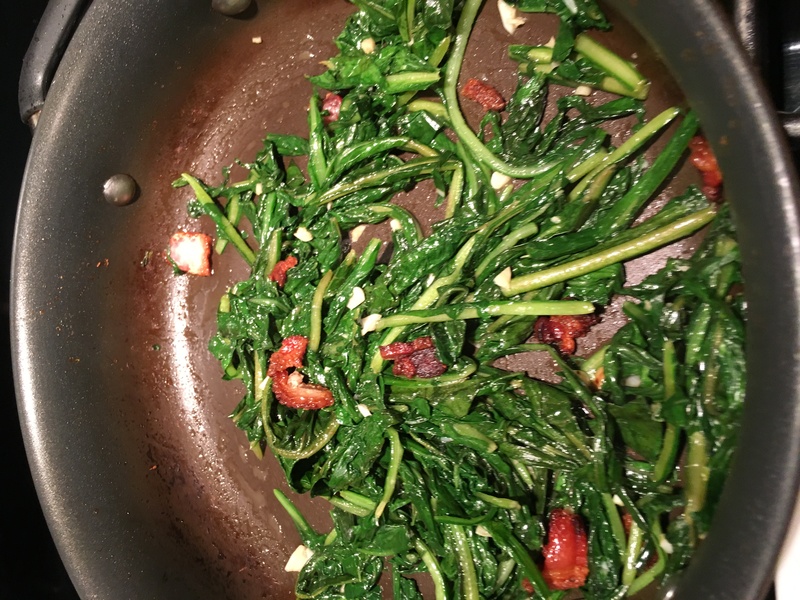 1 bunch greens (your choice collard, chard, turnip or spinach) stems removed and chopped. Cook pasta in salted water per package instructions. When done, reserve 1/2 cup pasta water, drain pasta and return to empty pan, cover and keep warm off the heat. Cut sausages into 1-inch slices, brown in a deep skillet sprayed lightly with cooking spray. When sausage is browned, add chopped garlic and stir a minute or two until the garlic releases its scent. Lower heat and remove sausages to a plate. Stir beans in the garlic and sausage dripping and add the chicken broth. Let broth warm for a few minutes, then add greens, cover and simmer until greens wilt. When greens are soft and darker in color, return sausage to pan and reduce broth until almost gone. Add reserved pasta water and vinegar to pan. Bring up to temp and reduce until you can still see a little liquid in the bottom of the pan. Add pasta to pan and toss to mix. Serve in shallow, wide bowls and garnish with grated parmesan. Adding a little pasta water to the sauce (remember the pasta water is salted) adjust the seasoning and, the pasta starch in the water makes the pasta silky. A Mexican bolillo roll makes a good serving of garlic bread when sliced, buttered, sprinkled with Italian seasoning and garlic powder, then wrapped in foil and heated in the oven. If I make garlic with a loaf of French bread, I eat it all. The bolillo is a better choice! This post was a reconstruction of how I made the pasta dish; I didn’t use a recipe. Play with your food and make it do different things for you. Another day in the Academy Test Kitchen working on salt-tenderizing a tough cut of beef. Let the steak come to room temperature before starting the salt treatment. A thick steak might take a couple of hours to lose its refrigerator chill. This time instead of burying the steak under salt, I gave it a very heavy sprinkle of salt on both the top and bottom. My guideline for timing was again 1 hour per inch of steak thickness.. This steak was about an inch and a quarter, so I set my timer for 1.25 hours. As fate would have it my sous chef was in piddle mode and took his time making a vinaigrette dressing for a very lush salad. I worked on the fringes of the counter to make an asparagus gremolata. By the time this Frick and Frack-like team finished these tasks, an hour and a half had passed. I thoroughly washed the salt off the steak and patted it dry, seared and cooked it in a dry heavy pan on the stovetop. I turned it regularly to give the outside good color and help the heat spread more evenly through the steak. I cooked it to an internal temperature of 145º, removed it to a cutting board, tented it and let it rest for 10 minutes. 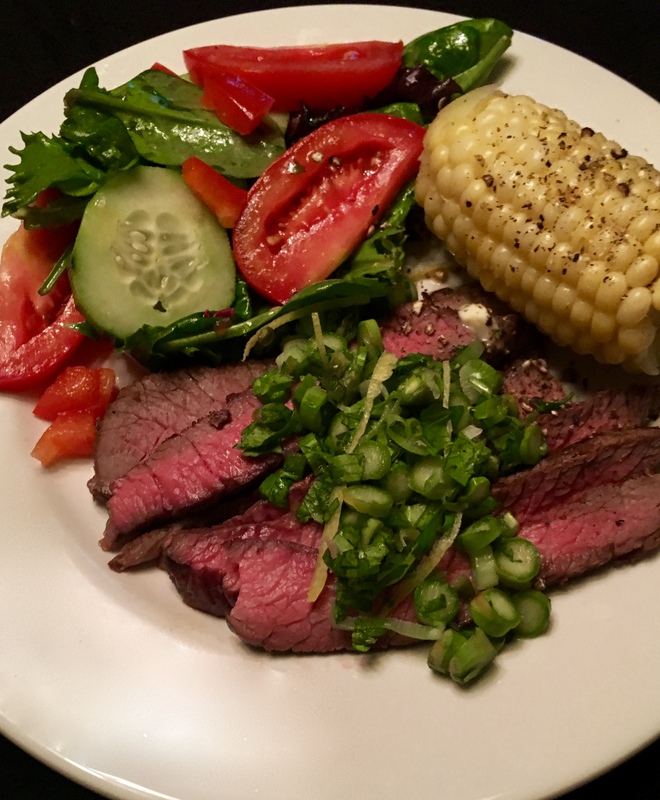 Salt-tenderized top round steak with asparagus gremolata and a tossed salad and fresh corn on the cob. The result was much more to my liking than the first attempt at salt-tenderizing a steak. Extra time in a lighter coating of salt made a decided difference in the tenderness of the meat. While it was not “tenderloin tender” as purported in the article I had read, it was more tender than you would expect top round to be. With a few grinds of fresh pepper, it was a very good steak. Another part of this experiment was an asparagus gremolata. Gremolata is traditionally chopped parsley, lemon zest and garlic as a garnish for meats. Who would think asparagus could be a condiment! I reduced the below recipe to make about 3/4 cup of the gremolata and it reduced well. It was so good, that I’ll make a whole 2 cup recipe next time! Place asparagus in a fine mesh sieve. Fill a medium bowl with enough ice water to cover the asparagus in the sieve. Swish asparagus with your fingers. Dip and swish asparagus at least three times to keep it crunchy. Pat dry. Empty and wipe out bowl. Toss asparagus, scallions, lemon zest garlic cilantro, vinegar and chile in dry bowl to combine. Add salt and sugar and toss again. Serve on meats, eggs, seafood. I might even call it a salad dressing with the addition of a little oil and put it on greens! I’ve read a couple of articles about using a heavy coating of salt for a period of time to tenderize tougher cuts of meat. It sounded interesting, so I gave it a try. I had my meat cutter slice me couple of inch thick top round steaks. 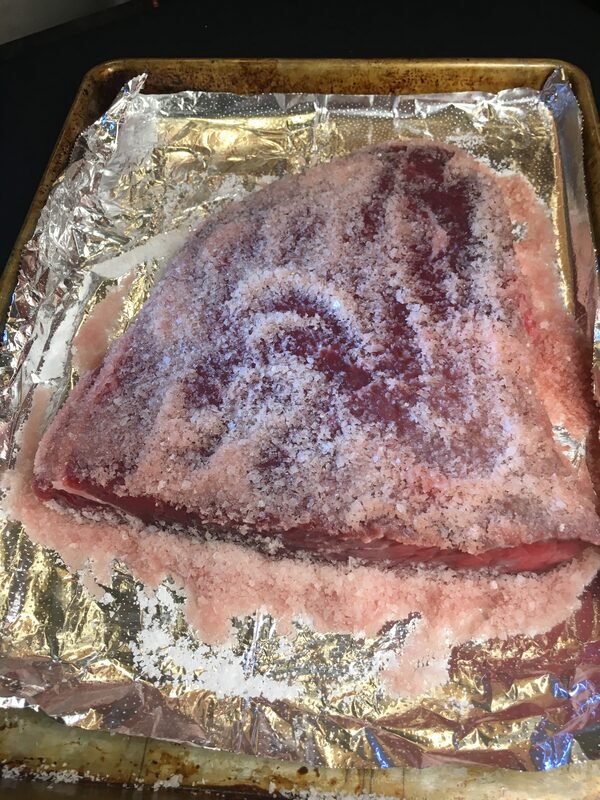 I used Diamond Crystal Koser Salt and covered the steak both top and bottom and let it sit at room temperature for an hour, per the instructions. The author’s rule of thumb is the meat stays in salt for one hour per inch of thickness. The technique calls for using a coarse salt – sea salt or kosher salt and definitely not table salt. Thinner cuts sit 30 – 45 minutes. 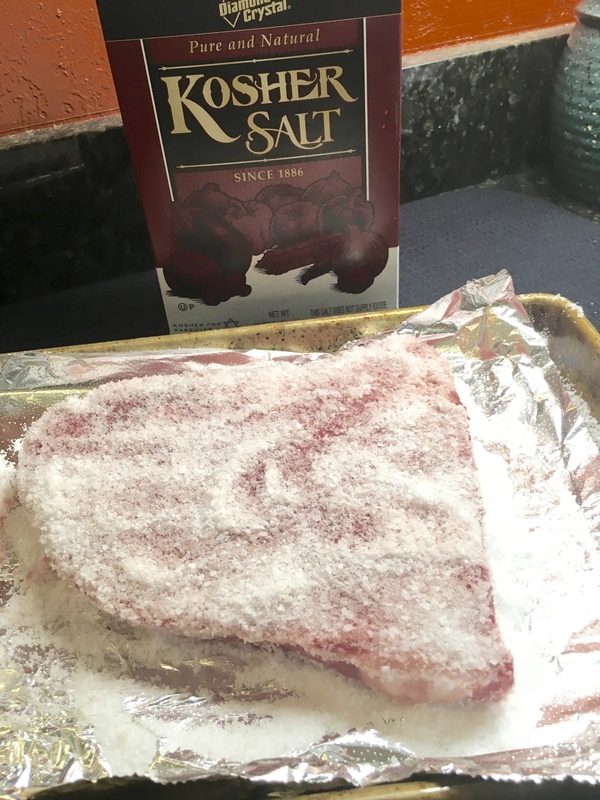 Top round steak marinating in kosher salt. As the steak sits in the salt, moisture drawn from the meat is absorbed and changes salt’s color. Plenty of salt remains on the meat surface. As it sits, the salt draws moisture from the steak. The proteins in the meat break down during the process and become tender. Some of the meat juices soak back into the meat and salt or other seasonings are taken up by the altered proteins. After an hour the inch thick steak needed to be thoroughly rinsed to remove the external salt. The meat must also be patted extremely dry. If the meat is moist, it will be steamed when it is cooked. After all this work, you don’t want to steam your steak! And don’t season the meat with additional salt. You may add pepper. 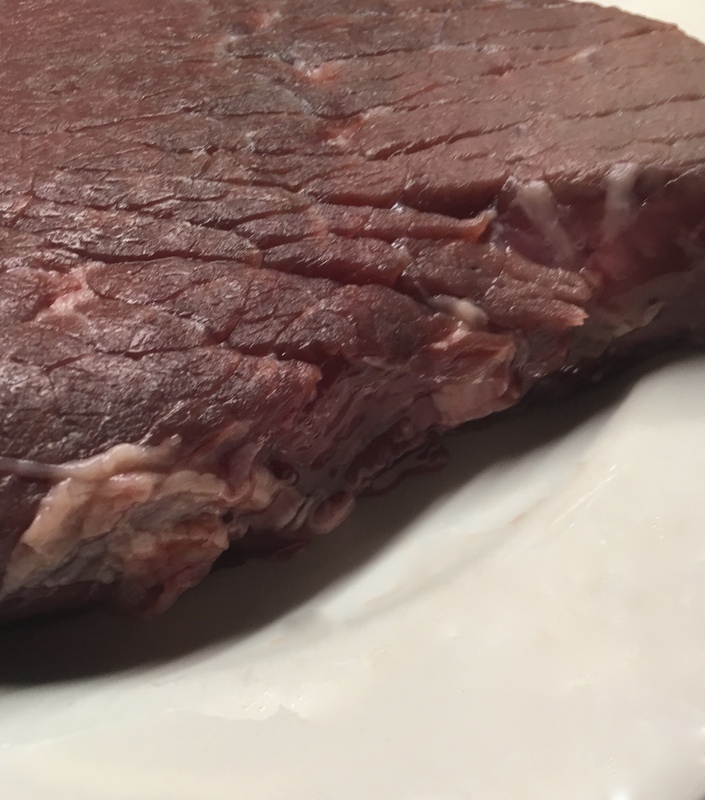 After the salt process is finished and the steak rinsed and thoroughly dried, you will note the surface is a darker color than it was originally. Per the article, I cooked my steak on the grill for eight minutes per side, then let it rest for about 10 minutes to allow the internal juices to redistribute. If you don’t let meat rest, all the flavorful juices run out when you cut it. Resting makes a great flavor difference. Good old steak and fries! The fries were baked avocado fries and a chipotle cream dipping sauce you’ve seen here before as was the caprese salad. The steak was beautiful and flavorful, but not as tender as I had expected. I’ve done more reading and found another article that uses far less salt in the tenderizing process. My market ran a buy one guy one dress special on the steak, so I have another one in the fridge and will run the salt tenderizing experiment again. A one pan dinner was better than fast food. On the menu, spicy crab cakes from the deli, microwaved and pan browned baby potatoes, and a caprese salad of baby fresh mozzarella balls, “baby” grape tomatoes, a drizzle of EVOO and a chiffonade of basil. Shrimp on chile cheese grits and corn with lime juice and cilantro – made about a mile from South of the Border. Sometimes you just get going and whip up something without a recipe. You can take a favorite dish change it, or you can interpret two favorites in a different way. I love chile cheese grits with a poached egg for breakfast. And I love shrimp on grits when I crave a southern treat. So, why not make chile cheese grits and shrimp? I added some grated jalapeño pepper jack cheese and five seeded and chopped long green chiles to yellow grits and licked the stirring spoon clean! I tossed the shrimp with a little oil and a generous sprinkling of Tajin chile lime powder. It is a great compliment to shrimp and something we have quite often. On the side, I served another summer favorite, lightly charred corn slices tossed with fresh lime juice and chopped cilantro. I put the corn on a bed of baby spinach and arugula with a couple of squeezes of lime juice. Ahhh, the joy’s of comfort food! I posted comments and the recipe for a Charred Lemon-Shallot Chutney that was delicious. I served it with crab cakes which was ok, but not quite the right match for it. I served it a second time with port cutlets. That was the right match for the chutney. It is difficult to find veal here for some reason, so I substitute thin pork loin cutlets and make squeal cutlets and squeal piccata instead. My squeal cutlets with chutney were accompanied by roasted Brussels sprouts and mushrooms with a sherry glaze. 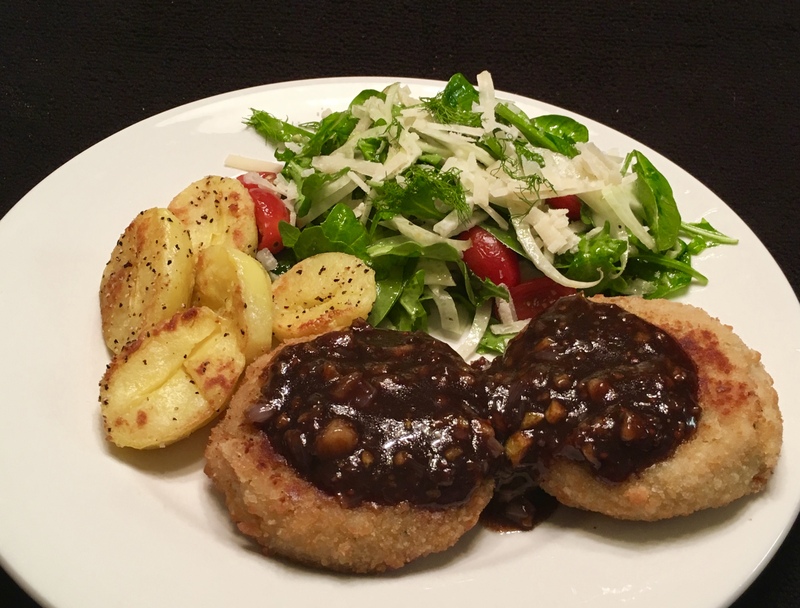 Charred Lemon-Shallot Chutney on squeal cutlets. Chutneys can be sweet and tart, spicy, chunky or smooth. We think of these tasty condiments as accompaniments for East Indian curries , meats, seafood and even with cheeses or just slathered on bread. I happened upon a recipe for a Charred Lemon-Shallot chutney that got me very excited. I love the caramelized sweet/tartness of grilled lemons with seafood and decided to give this chutney a try. It was fun to build a menu starting with a condiment. I’d been jealous of pictures posted on FaceBook by a friend who is visiting New Orleans. The picture was crab cakes topped by a poached egg with a simple side salad and tiny cups of what appears to be tartar sauce and thousand island dressing. The die was cast. Charred lemon-shallot chutney and crab cakes had to be it for dinner. Since it seemed to be a lemony destined evening, a simple salad of shaved fennel, grape tomatoes, arugula and baby spinach with a lemon vinaigrette and sprinkle of parmesan complemented the crab and chutney experiment. A few bites of pan browned potatoes completed the plate. Crab cakes with charred lemon-shallot chutney – sweet, tart and savory all at once. The chutney was a little smoky, a little sweet, a little tart and very rich thanks to its balsamic vinegar. It was as good as anticipated, but not a perfect match with the spicy crab cakes. I’ll try it tonight with either scallops or maybe pork tenderloin. I’d love scallops, but it is not always easy to find good ones here in the desert. The chutney takes a little prep time, and a close eye on the broiler, but is well worth the effort. Preheat broiler. Line a rimmed baking sheet with foil. Toss lemon, shallots, sugar, and 1/4 cup oil in a large bowl to coat. Season with salt and pepper. Spread mixture out evenly on prepared sheet; set bowl aside. Broil lemon-shallot mixture until beginning to char in spots, 8-10 minutes. Turn lemon rounds and shallot slices over and broil until almost completely charred, 6 minutes, watching closely (once they begin to char, they can darken very quickly; discard any burnt lemon or shallot). Let cool. Coarsely chop mixture. Place in reserved bowl and stir in vinegar, chives, Dijon mustard, and remaining 1/2 cup oil. Season with salt and pepper. DO AHEAD: Chutney can be made 5 days ahead. Cover and chill. Bring to room temperature before serving. Note: The recipe made a lot of syrup. I’m going to try two lemons and 6-8 shallots next time to make the chutney a little chunkier. I found boneless beef short ribs in what I call the Used Meat Bin – the reduced for quick sale corner of the packaged meat section. I couldn’t resist picking up a couple of packages. I didn’t follow a recipe. I just dredged them in a mix of salt, pepper and flour and browned them in a little oil. Setting them aside for a few minutes, I sautéd a couple of sliced onions and six thinly sliced garlic cloves. I concentrated some Better Than Bouillon paste in water and added it to the savories. I returned the ribs to the pot and added a bottle of Guinness Extra Stout, and placed the liner into the outer shell of my slow cooker. My slow cooker has a metal liner instead of the usual pottery one. I can brown and sauté on the stove top and then put it in the slow cooker and let it braise. I set the ribs for an 8 hour braise on low. When the ribs were done, I spooned the fat off the pot liquor and thickens it with a corn starch slurry. I served the ribs with mashed potatoes and a kale salad. A spoonful of the pan sauce with lots of the cooked onion and garlic made the meal! Toro Burgers and Bar has moved closer to where I live. That is a mixed blessing of convenience and temptation. The Toro logo is branded onto their buns. They offer 21 designer burgers on including game, chicken and, allegedly, crab. The menu features creative appetizers and sides, too. We’ve grown fond of the avocado fries – battered and deep fried avocado slices with a chipotle cream dipping sauce. Very rich and very good, and a bit on the wicked side, calorie wise. 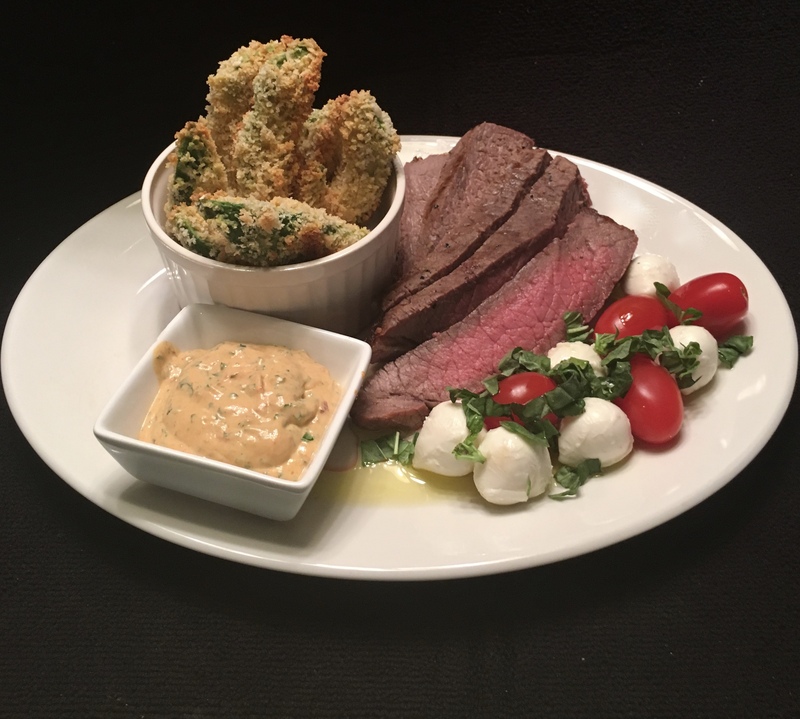 Meandering through foodie sites on the web, I found recipes for oven-fried crispy avocado fries and a chipotle dipping sauce. Of course I had to give them a try. For this meal, I considered the avocado as both a side dish and a fruit serving accompanying a pan-roasted chicken tampequeña entree for dinner. Panko crumb breading was the starch in the meal. Baking them works and yogurt in the dipping sauce lowers the calorie count considerably. Pan roasted chicken tampequena and baked avocado “fries” with chipotle dipping sauce for dinner. The baked avocado slices were crispy and buttery delicious on the inside. They’ll be popping up again for sure. I’m already contemplating adding some Tajin chile lime power to the Panko crumbs, nest time. 1 egg, lightly beaten. I like to use a boxed yellow egg product when breading. It is easier to add more egg from a box than to stop, wash my hands and beat another egg if I run low while breading. Pre-heat oven to 400º F. Line a sheet pan with foil. Drizzle pan with some of the oil and spread it over the pan with a pastry brush. Peel and slice avocado. I find it easier to halve the avocado, remove the pit and slice the half into thirds while it is in the skin. The slices can be easily removed from the skin by carefully using a soup spoon. Sprinkle avocado slices with lime juice, salt and pepper. Dredge slices in flour, dip in egg and coat with panko crumbs. Make sure the slices are well covered in panko. Place breaded slices on the greased sheet pan. Drizzle with remaining oil or cooking spray to help the slices crisp in the oven. Bake 15 – 20 minutes until the avocado slices are golden and crispy. 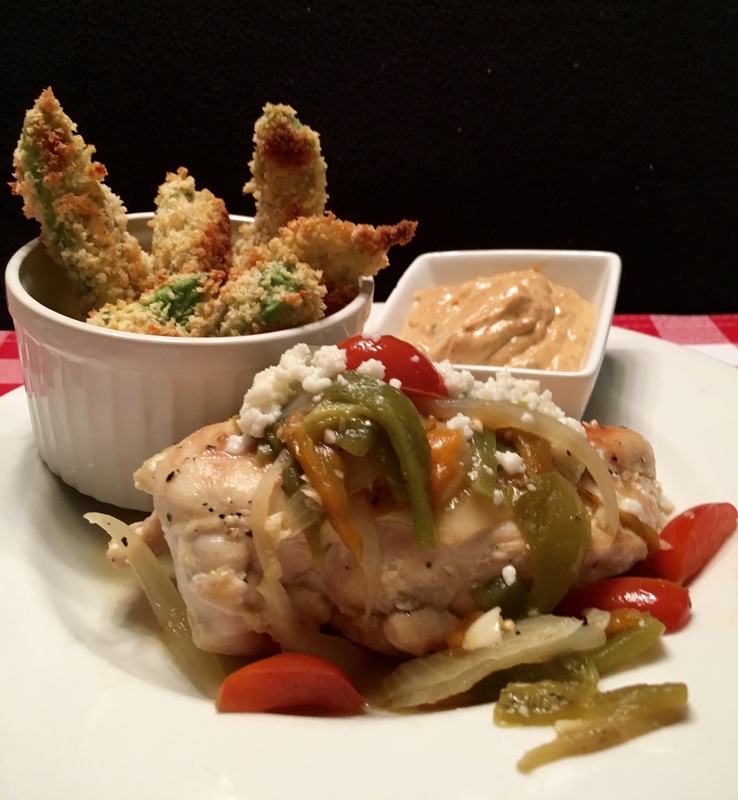 Serve with chipotle dipping sauce. The recipe says the fries will last up to 24 hours and then reheated in a toaster oven. That made me laugh out loud. No chance for left overs of these babies in my house! Place all ingredients in a blender or food processor and puree until smooth. Keeps covered in refrigerator up to four weeks. My dinner partner ate the leftover dipping sauce with a spoon and said if it were a little thinner, it would be as good as the chipotle crema enchilada sauce at the Carnitas Queretaro restaurants. It is spring in West Texas when you hear the first robin cough. We’ve had some blowing dust and a few days up in the 80’s while other parts of the country are getting snow and rain. I’ll take the heat and count on the spring winds subsiding soon. Weeds have begun to pop up in the yard and know I’ll have to dedicate a morning to working on them. One weed I’m happy to see is dandelions, a favorite treat for me! My children were afraid I was trying to poison them when I picked spring dandelions from the lawn and brought them in for dinner. In spite of their protests, they managed a few bites and lived to tell the tale. The other day, I noticed bunches of large dandelions in the produce department at the grocery. My heart skipped a beat and if I were a few years younger I’d have clicked my heels! I added a bunch of bright green, 12-inch long dandelions to my basket and started planning a Dinner at the Doublewide. We haven’t been down to the doublewide in a while and was time to visit for some good ol’ country cooking. No recipes for these dishes, but there are some hints and tips in the photo captions. Dandelion greens, steamed with a couple of tablespoons chicken broth and diced garlic; finished with diced bacon and drippings. 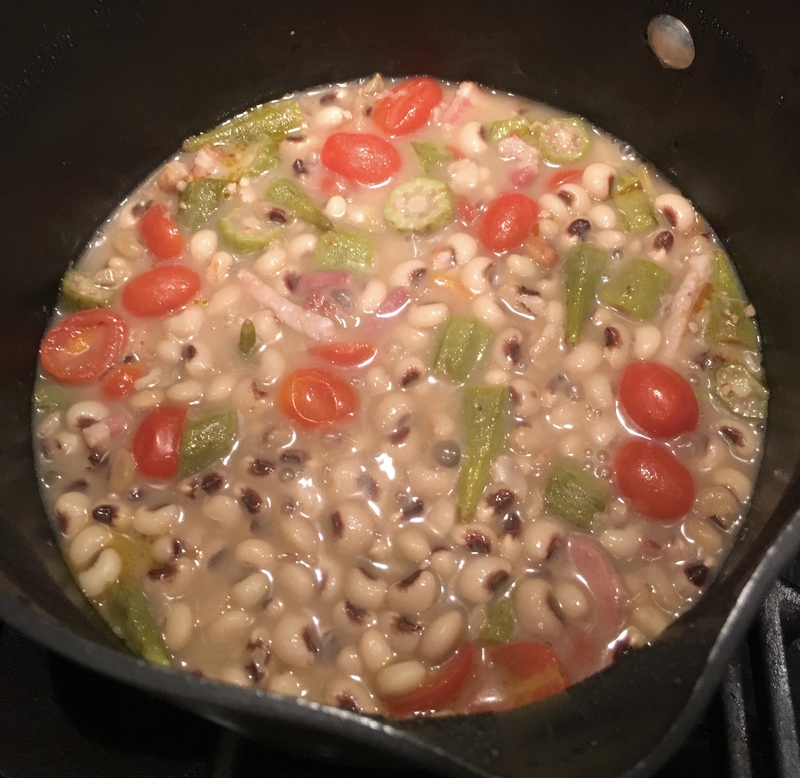 Black eyed peas (thank goodness the store has a frozen foods section) with okra, tomatoes and some slivered bacon. I slice the okra and sauté it for a couple of minutes to set the sticky secretion so my okra isn’t slimy. Halved grape tomatoes are flavorful and colorful. A sprinkle of sliced green onion finishes the list at the table. I use the package recipe for cornbread as a suggestion. Sometimes, I add whole kernel corn or chile to it, but I never add the sugar it calls for. 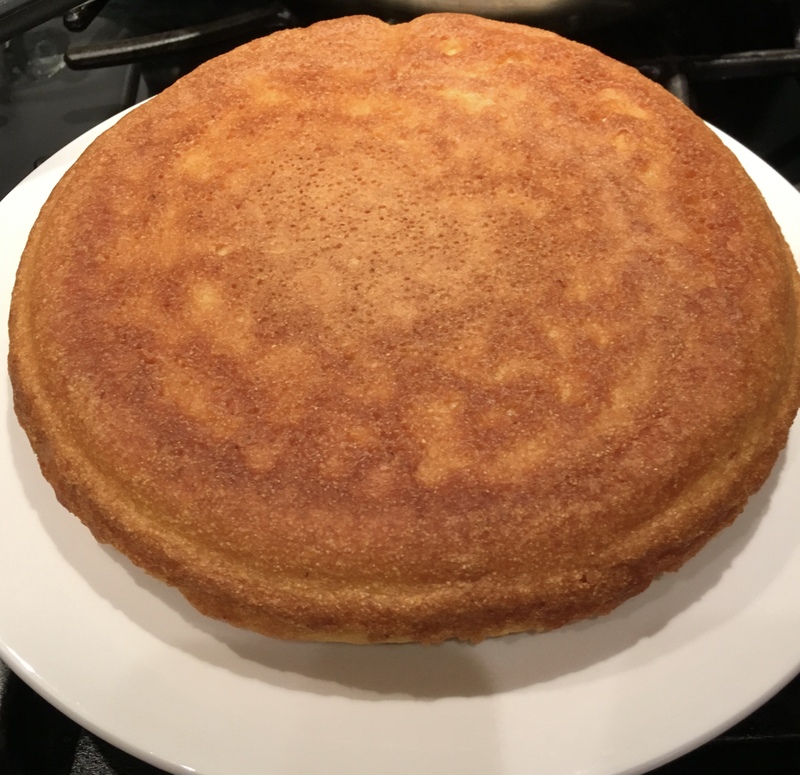 It is always cooked in a cast iron skillet that has been dedicated to cornbread exclusively for at least three generations. I have groomed my meat cutter at the market to cut me inch thick center loin pork chops that I fix with a dry rub and cook on my grill. He keeps telling me I need to cook for him since I show him pictures the meals I make with those chops. 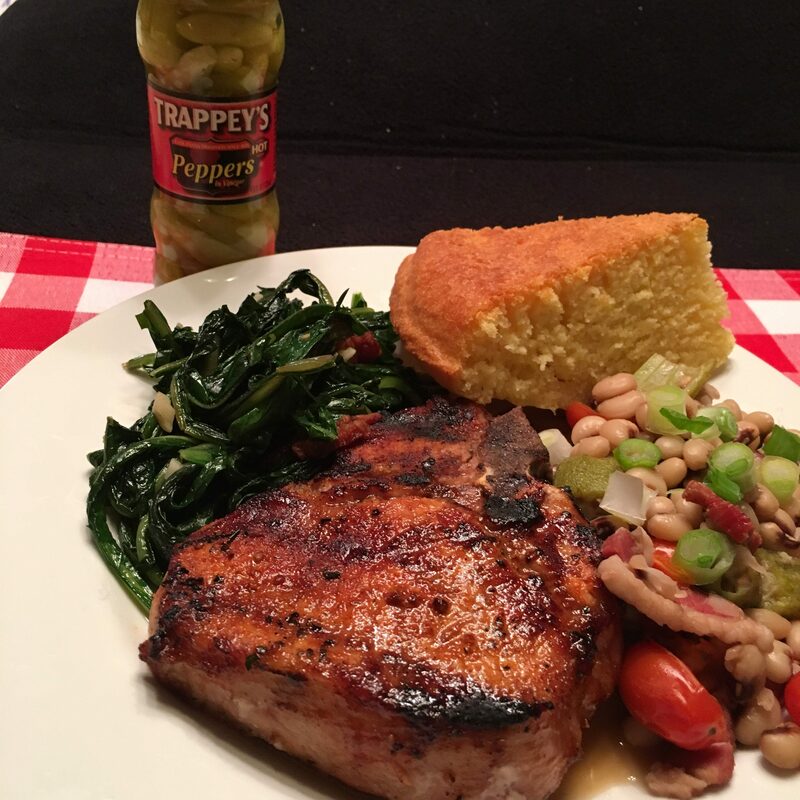 Of course you know you just cain’t have greens and black eyed peas without a few shakes of Trappey’s Hot Peppers in Vinegar. Trappey’s began in Louisiana in 1898. I know I’ve been enjoying it in Texas for more than 60 years! It is a staple in the doublewide kitchen. From the Family Table on Just bragging. From the Family Table on Way Back When Revisited; if it happened in the last century, it must have been way back when.